In some cases, wireless door lock control functions are normal but the hazard warning light and/or wireless door lock buzzer answer-back function(s) does not operate. In such cases, the main body ECU (driver side junction block assembly) hazard warning light and wireless door lock buzzer signal outputs may be malfunctioning. Troubleshooting should be started after confirming that the customize status of the answer-back function has been switched on. 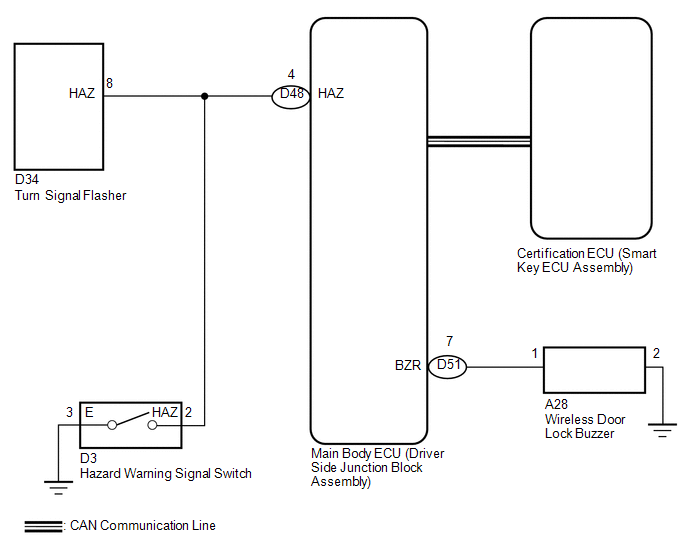 (a) Check the wireless door lock control functions by operating the transmitter switches. 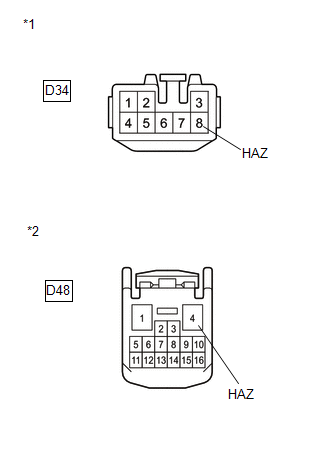 Wireless door lock functions are normal but hazard warning light answer-back does not occur. Wireless door lock functions are normal but wireless door lock buzzer answer-back does not occur. Doors cannot be locked or unlocked with transmitter. (a) Check that the hazard warning lights flash continuously when the hazard warning signal switch is pressed. Hazard warning lights flash continuously. Hazard warning lights turn on/off. (a) Disconnect the D34 turn signal flasher connector. (b) Disconnect the D48 main body ECU connector. (c) Measure the resistance according to the values in the table below. (a) Disconnect the D51 main body ECU connector. (b) Disconnect the A28 buzzer connector. (a) Temporarily replace the wireless door lock buzzer with a new one (See page ). 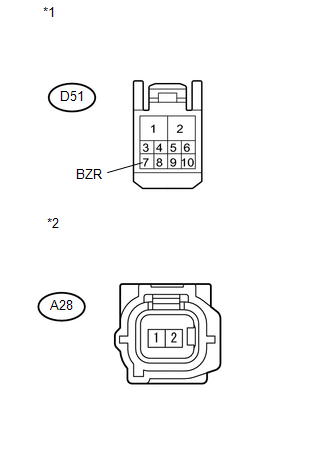 (a) Check the operation of the wireless answer-back function. Wireless answer-back function operates normally.